Have you ever had one of those days that made you want to pull your hair out and scream as loud as you can? I rarely do but yesterday morning I DID!!!! My sweet little website that I have had for about three years was hacked and they have ruined my Nursery Room!!!! All of my images are gone and not visible. Instead I had an ugly(scary) page from a Turkish Soldier website pop up!!! What a shame!! Because of one person's malicious game, 86 websites were tampered with!!! Now, I need to have it repaired so I can sell my dolls again. What a mess! Hopefully, it will be repaired fast! Oh, that is just awful!!! How on earth do they manage to do that. It's so much work building a website - how awful to have to re-do it!!!! Hope it is all sorted quickly! AAAAAAAAAH - I'll tell you what's scary Patty. That picture you posted is SCARY!!! LOL I swear it looks just like this drag queen in Portland. Patty that's such a drag (no pun intended), I'm really sorry to hear that. I don't understand people who don't have anything better to do with their lives and actually get a kick out of doing this kind of stuff. I hope you have it back up and running in no time. I am sorry to hear it Patty. I also cannot understand the enjoyment someone would have doing that. I do hope you can repair it soon. I would be totally at a loss on how to fix something like that. Thank you girls!!!! I have been really bummed out about this. It is going to cost me big time to switch over to a Zen Cart program but it has to happen so I can sell dolls again!! 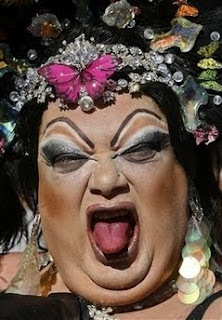 About the picture.....LOL.....it is a Brazilian Drag Queen. I thought he looks like he is screaming like I wanted to yesterday!! O no, Patty. What a PAIN!!!!! I don't know what I am going to do if my blog is hacked! 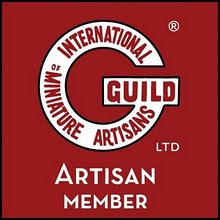 Probably give up blogging AND mini making too! Siento lo que le ha pasado, no entiendo esa manera de divertirse. Espero que lo solucione pronto. It's just awful and a real nightmare. I think it is what we all dread. The net is very useful, brings a lot, but there can always be dreadful experiences. I can't understand why some people do that kind of things. It just sometimes makes you want to stop everything.I hope you will soon be able to get back to a zen attitude. It is sad that there are people who enjoy taking pleasure in doing this to others, especially considering there is no gain to them as well. Sorry to hear that you have been attacked this way. I love your dolls, your work is fabulous! Patty, couldn't you set up a page on your blog here and post your dolls you have for sale with a link to paypal? If people have a paypal account, all they need to do is send the money to your paypal account (or the e-mail address you set up with paypal). In fact, I was thinking of doing something like this maybe. If nothing else, it could be a temporary thing until you get your regular site repaired. Thank you again for all of your sweet supportive comments! Made me feel better. Kristy, Thank you so much for the suggestion but I have established myself for three years on this website that I have and I need to have my photos connected to it or my customers will think I have quit making dolls. My web designer has a temporary fix that she can do for everyone....open an account with Picasa and she will have it linked to my web so when someone hits the Nursery button it will take them to my images at Picasa. Seems better for me.....Thank you sweeties!!! I'm so sorry what happened to you. I hope your site will soon be full of your beautiful babies.